Makigami Koichi had an idea. He wanted to hold a concert, very special one. And in September this year, his dream gig will take place at last - top performers of throat singing from both Altai and Tuva regions sharing the same stage, for the first time ever in Japan. He has been into throat singing for almost twenty years. 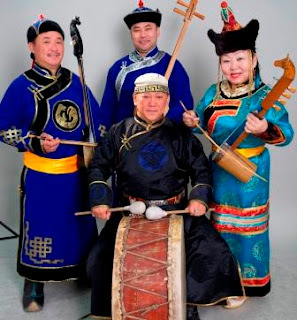 Throat singing is a folk culture in Siberia region and has a lot of styles. It really varies. And among them, his favorites are Kai from Altai Republic, and Khoomei from Tuva Republic. In early 90s, Makigami happened to see a performance of khoomei in Japan. Immediately he was quite impressed and wanted to do it himself. So naturally he asked the singers for lesson on the spot. Next year he went to Tuva for himself. He wanted to deepen his knowledge of khoomei so badly, and he had to go there. Now he has been commuting his native country and Tuva once or twice a year for last 20 years, and now has a lot of friends there. Then, in mid 90s, there was another life-changing event for him to happen. He was invited to a music festival in Europe, and met a singer from Siberia. The singer's performance was so great. He was carried away by it. The singer's name was Bolot Bairyshev. His native land is a republic in siberia, called ALTAI. And Altai's throat singing has its own name, KAI. The two became friends and started performing together. In 2008, Bairyshev, Makigami, and (Hikashu's drummer) Sato Masaharu formed the group called АЯ (pronounces "a'ya" - A is the first character, and Я is the last in the Cyrillic alphabet. And the group's name means "everything in between the first and the last.") and recorded an album called Tokyo Taiga, which is now available on John Zorn's Tzadik label. 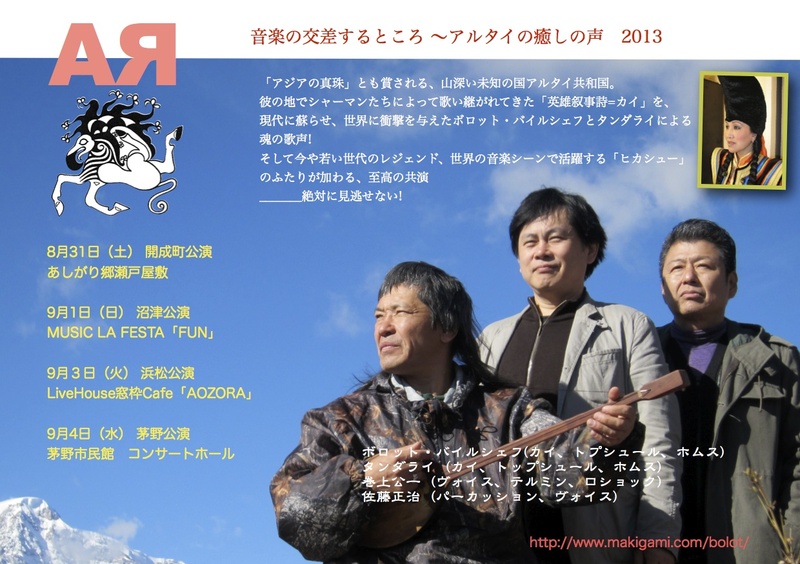 Besides learning and practising throat-singing, Makigami has been promoting the culture in Japan for years. Inviting performers from Siberia, making records with them, organizing concert tours and workshops. He always strongly recommends that you should be under the guidance of the people from Siberia if you really want to learn throat-singing and that's why he organizes a yearly tour to Tuva. Also, he teaches throat-singing himself for the people who cannot afford the trip to the soils of Siberia for some reasons. Concequently, a whole generation of throat singers now is active in Japan, and many are his disciples. And he stresses the concerts, which will be held in Tokyo and Osaka, will be once-in-a-lifetime event. His remarks are understandable because such a concert is pretty unlikely to happen again, even in Siberia. All are the great performers, including Mongun-ool Ondar, who just got the first award at the 6th International Khoomei Symposium held in Tuva this spring. Do not miss the opportunity. September 8 Suita, Osaka * admission free, invitation only. apply by mail. applications must arrive by August 16. @ Music la Festa "FUN"
Admission free, invitation only. Apply by mail (a reply-paid postcard). Note: applications must arrive to the Museum's office by August 16. See here for details.